I recently learned that up to 2.000 people work in the background to make the SummerJam a success, a safe and enjoyable festival for each and every one. Besides the artists who perform on two stages, no one stands in the limelight more often than "Mr. Summerjam" Andrew Murphy. 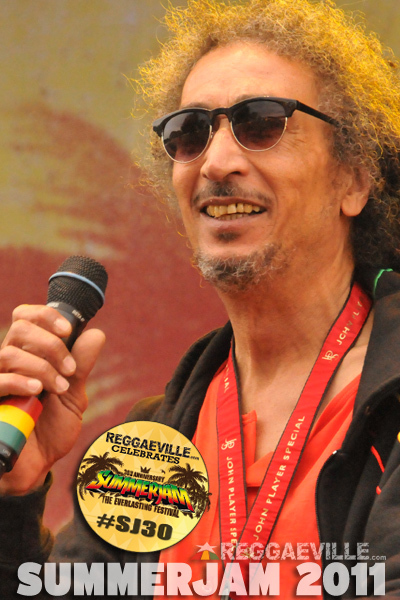 He is a part from the whole event from day one, so Reggaeville linked up with him to get an insight into what it feels like to be up there. And found out about a big surprise in the process! Greetings Mr. Summerjam! I read that people started to call you that way over the years. How did you get involved in the whole business? How did it all start? At the very beginning, the moderator from Rockpalast, Alan Bangs, was moderating the SummerJam, but somehow the organizers had the feeling it didn't fit, that a Reggae festival needed something different. So, one day, we sat together and the guys from Contour looked around to find a moderator for the show and then one of them said "Andrew?" (laughs). Since then it's been a great honour to be chosen for something like this, because I became more or less Germany's first Reggae moderator. I don't know who came up with that name you mentioned, I never told them to call me Mr. Summerjam, but they all do! And the band you talked about earlier, Rhapsody, is it still active? No, not anymore. Many years ago some of the guys went back home, it was a band from Barbados. I'm from Barbados! We tried for many years to keep it up, but after a while we got tired of touring. When you are on the road for so many years, you know... I still play music, but I try to do it in a more relaxed way. Like before, living on the bus and travelling from day to day, one concert after the other, I don't think I could do that anymore. I'm too old for that (laughs). Do you have a new band or you just play for yourself? There are some friends of mine, especially a fantastic guitar player in the Arnsberg area, and sometimes we get to do things together. My brother is a drummer, he lives in Essen, that's not so far away from me, so sometimes we get together and play. 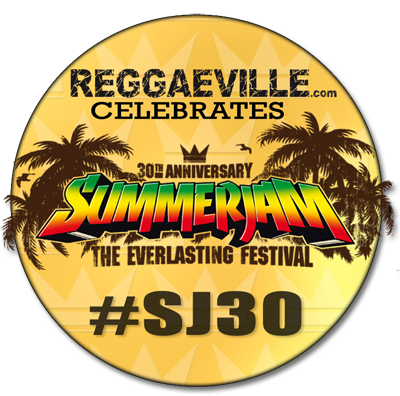 I don't know if I should say that, but... it's 30 years anniversary… I'm going to play this year at the SummerJam! I hope people will take their time to see it because it's on Sunday, I do the opening show at 2pm. So I think it will be a big surprise this year when I play. I always promised it, and this year is the time because it's the jubilee. I'm performing with a very young band from Remscheid called Babylon Exit. You see, I wanted to do something special for the anniversary, something to remember all the years, all the times that have passed and all the artists who contributed so much to make SummerJam what it is... So many have left us lately. Like Gregory Isaacs, John Holt, Dennis Brown, and especially those who have never made it to SummerJam, Bob Marley and Peter Tosh. These are probably the only two acts that I have never really seen in person. All the rest, like anyone that has a name in Reggae music, I have seen and I'm very grateful for that, it's been a great experience in my life. So you take your time to watch the artists perform? Yes, for sure! Because as a musician you look forward to see other musicians play and experience great music. SummerJam has been providing some of the best music for any festival I have seen in this world. Is there any artist in the line-up of this year that you are looking forward to or that you haven't seen yet? There are lot of acts that I will see for the first time. I haven't really checked the line-up in detail, but I know Beres Hammond is going to play, and this is one artist I'm always looking forward to because his shows are always fantastic. You see, I have a great love for singers, for the great voices in Reggae. Especially Dennis Brown and Bunny Rugs from Third World, Garnett Silk... these are the voices that really move me, that's the kind of Reggae music I grew up with, so I'm a fan of the singers. Can you tell us something about the backstage vibes? Most people who come to Summerjam experience all the music in front of the stage, so maybe you can let us in on how it is behind the scenes? That's why I'm asking you to tell us so people can get a picture! As I said, it's just the dressing rooms, good vibes, good food and good people. And if the artists have time, of course they also go and watch other artists perform. It's a matter of respect! I remember times sitting with Bunny Rugs at the side of the stage, watching other artists perform, so I spent time with many many artists behind the stage. Last year Gentleman was there, watching other artists perform, it's a matter of respect for other people's talents. It's still very present, this brotherhood in Reggae. Speaking of brotherhood and the vibes, what do you think is the potential benefit a festival like the SummerJam can bring to its visitors, to German society, maybe to the world even? I think the Reggae music that I know and love has always been a reflection of peace and equal rights and justice and human rights in general. Over the years a lot of things have changed, like now there are so many different scenes in Reggae music... the Raggamuffin scene and so on. But I think in general it's still that underlying feeling of a black music. It started out as a music for black awareness, but right now Reggae music as a style is present all over the world. All nations are playing it because it's one of the only music that every single person can really communicate with. It generates that vibe, that peaceful, loving, dancing, happy vibe. It's a happy music and I hope it remains that way. So do you think there is a way to like collect and channel this energy to have a positive impact, to improve situations in different places on earth? Because, as you say, Reggae music is present all over the world and there are so many people who are into Reggae and into positivity, so what do you think is needed to bring people together for a good cause? Music can move mountains! Music can do many things, but I believe we need more than music to change the world when we look at what's happening right now. I think we have to have an understanding of human rights, it has to play a much greater role, and the leaders of the world have to understand that... I think we are still living in an age where there is tyranny and dictatorship and fighting for power and struggling for all kind of religious or whatever reasons... that really has no benefit to mankind. Music now, if you go through the history of Bob Marley and his music, there's so much that has already been said... like, when you look at the quotations, the songs like War... Peter Tosh, all those songs from Vampire to Legalize It. So much has been said and still we are waiting for change. And I think there's always these forces that don't want people to unite, because when people unite, they are not easy to control again. 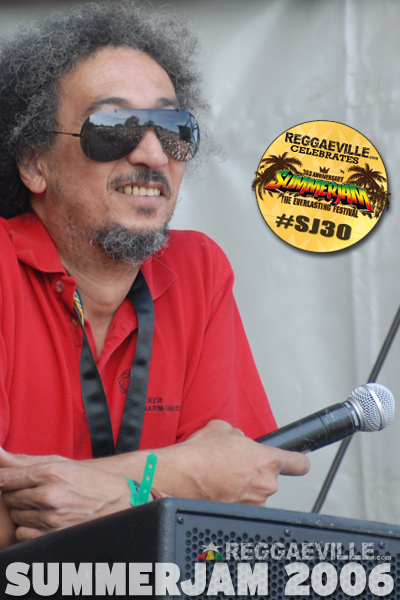 Music can play a very big role in that, and I think over the years we have said so much... not only in Reggae music! In the era of war, what Bob Dylan and Woody Guthrie and so many folk singers have said and so little has been changed... They are still fighting wars, you still have so many problems all over the world. But I think that's why festivals or even concerts are so important because the music gives people a vibe and a happiness they can feed on for the next months, when times get rough. I think people like you are in a position to channel that energy... because you are up there, everybody is listening to what you say. It's a really good thing that SummerJam brings so many people together, and with a few words you can inspire everybody to like take it home for the whole year! That for me is very important when I stand in front of this huge crowd in SummerJam. It's that everyone out there feels the vibe of togetherness. 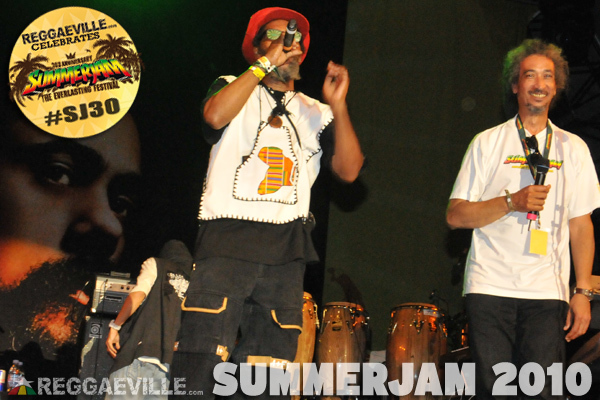 SummerJam has always meant... for me, it's like a family coming together every year! And it's groiwng, it's always growing. It started out like a family festival and people used to come with a baby pram and dogs and so on. There is no space for that anymore, but still there has always been this little thing that hangs on that festival and that is coming together and having three days of peace, love and harmony and that is the way I always imagine and I always want it to be. That's the way we want to keep SummerJam for ever and ever! Are you still nervous when you go on stage? No. Nothing makes me nervous anymore, it makes me happy! The first day, Friday, when I walk on that stage, it's happiness! Like, meeting the guys from the crew, it's like family, the whole crew that's working there, they do such a magnificent job, the security, everyone. It's like we all know each other and at least we see for three days in the year and those three days are the most wonderful days in the year. Do you have a special wish for the anniversary? I wish for very good weather! (laughs) And, as usual, that nobody is late and nobody has problems with flights and stuff and everything runs like a clockwork. And that the vibe is as beautiful... I think this year will be tremendous because this thirty years will be very very special. I know it's going to be a great show and I just want everyone to get there safe and get back home safe so we can meet again next year.